The Paston Letters provide a unique commentary on the Wars of the Roses at both a national and a local level. 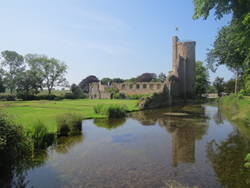 The Letters record the changing fortunes of ‘House Paston’ as the family navigated their way through their various sieges and confrontations with the Dukes of Suffolk and Norfolk at Gresham Castle, Hellesdon Manor and Caister Castle. What little conflict actually took place in Norfolk invariably involved the Paston Family.